What is your PQ IQ? Find out and learn how to raise it! The answer is B) $260,000 (according to the Aberdeen Group in 2015). True or false: 80% of all power quality problems originate on the customer’s side of the meter or from within a facility. This next question is one that only you can answer. How high is your Power Quality (PQ) IQ? The good news is that you can elevate your PQ IQ. It could be urgent for your facility’s reliability and efficiency. PQ issues can be hiding in plain sight, causing multiple problems that go undetected. Many facility managers are unaware of power quality issues that drain efficiency, reliability, sustainability, and ultimately money. Just because you are unaware of them is no guarantee that serious power quality issues don’t exist. 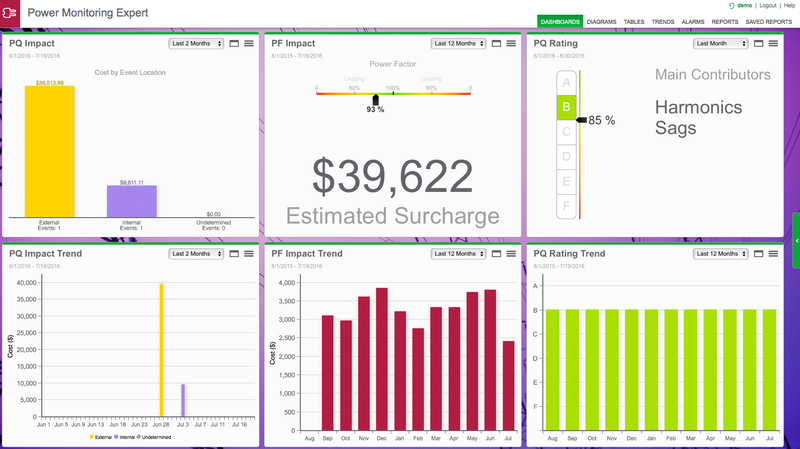 Do you have a systematic plan to manage both power quality and energy efficiency? You can boost your PQ IQ to identify and mitigate power quality issues by deploying a power monitoring system including power meters like the PowerLogic PM8000 and power management software like EcoStruxure™ Power Monitoring Expert. Improving PQ saves you time and money, increases uptime, prolongs equipment life, provides a safe workplace, and increases efficiency. Hidden PQ problems can contribute to a host of other problems. Avoiding PQ issues like sags/swells, transients, flicker, or harmonics, is crucial. Did you know that these disruptions could cause downtime and a plant’s typical restart time after a shutdown is 17 hours? Or what about this surprising fact: 50% of mission critical power outages are attributable to PQ issues! Some electrical companies charge penalties for poor power quality. Download the PQ IQ Infographic to learn more. How do you increase your PQ IQ in order to gain such critical knowledge and information? Firstly, deploying power management software helps facility managers manage power quality in a holistic way, providing industry standards based PQ reports like the CBEMA-ITIC curve. Using the Power Quality Performance Module further improves a facility manager’s ability to check power quality status. The PQ Performance Module also provides readily available information helping you identify all the ways that PQ is affecting your business, as well as how to protect your assets. As part of a Schneider Electric system, the Power Quality Performance Module can help detect, identify and diagnose PQ issues. It provides a comprehensive and understandable overview of your system health. Another key element to understanding and revealing complex PQ conditions is installing power and energy meters like the PowerLogic PM8000 series meter. It’s powerful and precise enough to gather the data you need. With this meter, you have the means to monitor and manage PQ compliance and analyses that were once reserved for more advanced meters. The PM8000 series meters are compliant with the following PQ compliance-related standards: IEC 61000-4-30 class S, IEC 62586, EN 50160 and IEEE 519. True or false: My facility operates at optimum power quality performance. Learn more about power and energy management.